It is a virtual seminar which happens on the web. The word Webinar is a mixture of two words web and seminars which mean organizing seminars or conferences online. You just need to have access to the internet and you can be a part of a workshop with any of gadgets be it your personal computers, laptops, or your smartphones. You connect with your audience and share any information, knowledge or experience. If you have an online business, then this is a must read the post for you all as we know you have to contact your audience with the online means and you must need one particular software which can make your work easy. 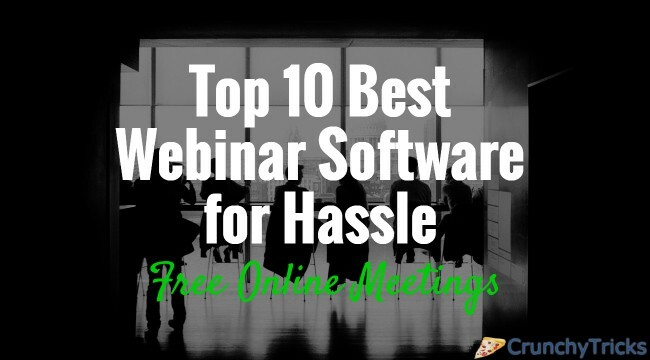 I have come up with top 10 webinar software in the post further, and the information is well studied before posting. Right webinars are crucial for your online business or blog, as it is the one with which you interact so it should be made correctly. Also, any person who is active online can be your audience so it helps to create more audience that’s why it should be done properly. You get to interact with your customers or audience directly. You enjoy the feature of live interaction, and when broadcast gets over then, also you have the opportunity to reach to your target group as each seminar can be watched later. It is readily available and handy to use; attendees can quickly ‘login’, and it is also easier for the presenters to present whatever information he/she wants to. Now, further are given detailed information on webinar software. Google+hangouts is a webinar software and provides communication services that allow the members to be a part of text, audio or video chats on both personal and group basis. You just need to have a free Google+ account. Hangouts are built in Google+ and Gmail. It is very cost effective. Hangouts also have an option which is known as Google Hangouts on air which permits the Google+ users to go live on air, i.e., broadcast content live on YouTube. It allows a maximum of 10 people in a video or audio chat. Live streaming directly attached to your YouTube channel or website. It records and publishes content online so that audience can access to it later. It is handy and easily available on every device. It does not imply any cost. It is a software application which allows you to have a spoken conversation with someone over the internet. It is a great software for group discussions or even studying. It allows a maximum of 25 people to be a part of video calls. You can have access to voice calls in this software. You can make calls worldwide to mobile and landlines in low prices and Skype to Skype call is free of cost. One can share files which include screen sharing, contact sharing, contacts sharing. It also provides the person with a feature of translation i.e., if a person speaks another language it will translate voice calls, video chats and text messages instantly for you. It is powerful webinar software for Google+. It adds webinar functionality to Hangouts. Person can sell its stuff by a click. It is also a software used by webinar producers. It is not free, the subscription starts at 72 dollars per month and can add up to 100 people. It provides users with HD video recording and calling facility. One can have access to all the archive records. It also allows you to conduct polls and surveys. Cisco presented WebEx as an online class benefit for planning on the web gatherings, occasions, and meetings. It comes engaged with numerous helpful elements and scales well and is very appropriate as a top of the line alternative. Proficient Webinar Planning and Production.It costs $79 per month with 100 attendees. It is a software which gives all critical capabilities from the desktop to your mobile devices. It enables you to drive meeting directly from your Android tablet or smartphones. It is not iOS users. It requires Android version 4.4 with internet accessibility with 3G/4G speed. It starts at $45 per month. ClickWebinar has been outlined by the people at ClickMeeting and fills in as a top of the line online course answer for anybody requiring to work together remotely for occasions and online classes. Full desktop and program sharing. Plans begin at $30/month for up to 25 participants. Accompanies 30-day free trial offer. AnyMeeting is intense Webinar Software went for giving a secure web conferencing stage to private companies. iLinc is efficient and extensive Webinar Software. It encourages online meetings through multi-point video, application sharing, white-boarding and other community oriented apparatuses. It helps coordinators to oversee welcome and enlistment prepare. It gives an intelligent and straightforward to utilize interface through which you can make tweaked, robotized updates and subsequent meet-ups, design ideal session settings and the sky are the limits from there. iLinc gives world-class virtual classroom innovation which enhances taking in the earth and grows alternatives for adequately conveying essential data to an assortment of groups of onlookers. OnStream Media has many cloud-based answers for media facilitating, webcasting, and online courses. Their particular online course item is an undertaking grade, which means it's intended to scale significantly. Live sound and video gushing. Member rundown and rights administration. Cost Per use. No essentials. Must call for quotes.